For the design of wood-frame buildings 60 ft in height or less, the “envelope procedure” for determining Main Wind Force Resisting System (MWFRS) loads is the most commonly used. External pressure coefficients from the envelope procedure have been developed to represent critical loads on the main structural elements, which are “enveloped” to reflect induced actions on a building from various wind directions for various building geometries, roof heights and roof slopes. External pressure coefficients for Component and Cladding (C&C), on the other hand, represent peak pressures which occur over small areas. Localized negative pressures associated with C&C loads will almost always control design of exterior sheathing and cladding elements, such as wall sheathing, wall cladding, roof sheathing and roof cladding and the attachment of the sheathing and cladding to the building's structural frame. In accordance with ASCE 7, the MWFRS is “An assemblage of structural elements assigned to provide support and stability for the overall structure. The system generally receives wind load from more than one surface.” Examples of MWFRS elements include roof trusses, roof and floor diaphragms, and shear walls. Individual elements of the MWFRS may also be subject to C&C load requirements. These include sheathing, cladding, wall studs, individual roof rafters and elements of a roof truss, and short-span trusses resisting wind loads from cladding. When wind encounters a building, the airflow changes direction and produces several varying effects on the building. Exterior walls and other vertical surfaces facing the wind (windward side) and perpendicular to its path are subjected to inward (positive) pressures (loads). The wind continues to flow around and over the building, resulting in outward (negative) pressures (loads). This phenomenon produces suction or outward pressures on sidewalls, the leeward wall and, depending on geometry, the roof. Wind pressures on a roof vary based on roof slope and location on the roof with greatest wind pressures occurring at roof edges. Roof surfaces on the windward side with flat or shallow slopes are generally subjected to outward (negative) pressures. Moderately sloping roofs (up to 28 degrees) are subjected to an overall negative pressure. The windward side of high-sloping roofs respond similar to walls and sustain positive pressures, while roof sections on the leeward side are subjected to negative pressures. For sloped roofs where the wind direction is parallel to the ridge, the wind pressures act similarly to a flat roof where the roof is subject to outward (negative) pressure. 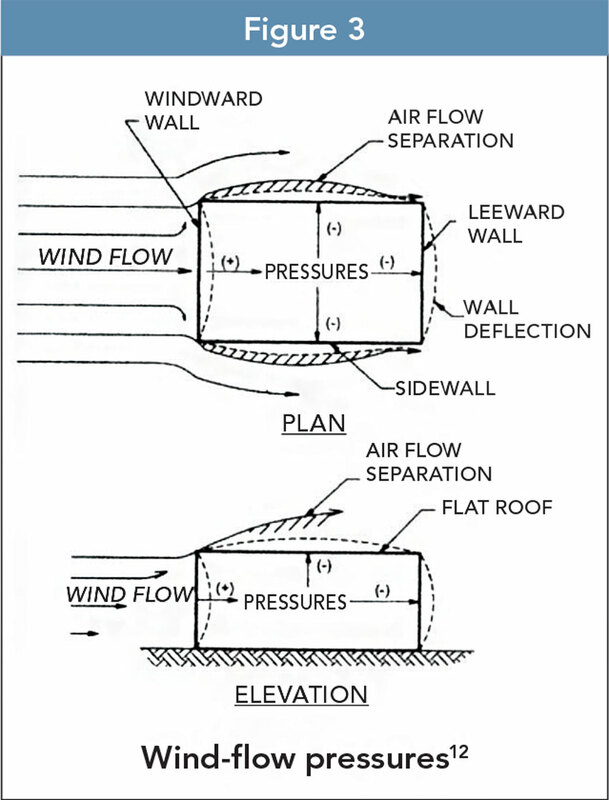 The greatest wind pressures acting on a building are negative pressures (suction) and the locations of the greatest suction pressures occur at wall and roof edge zones as illustrated in Figure below. 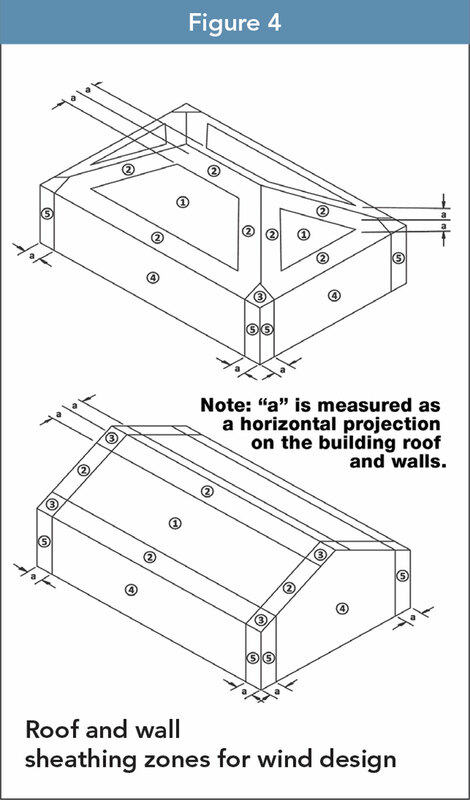 Edge zones at wall corners, roof ridge and roof perimeter represent locations of potentially high suction forces relative to the central portions of the wall or roof. The extent of increase in suction forces for roofs depends on roof geometry but increases of two or more times the negative pressures associated with central wall area are possible. The maximum differences in wall pressures are between central pressures and edge zone pressures; however, the approximately 30% maximum difference will not usually necessitate different nailing schedules and sheathing thicknesses between portions of the wall in the edge zones and away from the edge zones. Wall sheathing thickness and spacing of fasteners attaching the sheathing to wall studs throughout the wall length are commonly based on higher end zone pressures to simplify installation. For example, reduced sheathing fastener spacing and potentially thicker sheathing necessary for resistance to higher edge zone pressures are commonly used throughout the wall length. Another technique to allow for use of a consistent sheathing thickness and spacing of sheathing fasteners is to reduce stud spacing in wall edge zones. The reduced stud spacing reduces the span of the sheathing between studs and also provides for more points of attachment of the sheathing to the framing for resistance to the higher edge zone suction pressures.